Rhino Gas Post Drivers, Fence Pro, Ranch Pro, Multi-Pro Post Pounders. GPD-30, GPD-40, GPD-45 Models. The first choice of fence contractors! *Rhino Pro-Series Post drivers are Honda OEM certified and carry Honda’s 2 year residential and 1 year commercial warranties. Rhino GPD drivers carry a lifetime warranty on their impact parts. Rhino's innovative Pro Series Gas Post Drivers are the best in the industry. Their ergonomic design allows for ease of use; one person can drive a post in seconds. In spite of the power offered by the Honda certified 4-stroke engine, handling the GPD Pro line is very comfortable thanks to Rhino's CIS vibration dampening handles. Unlike other post drivers, the Pro series doesn't require any additional equipment. You don't need to haul around a bulky air compressor, propane tank, or hydraulic power source; just fill your Pro up with regular unleaded gasoline. 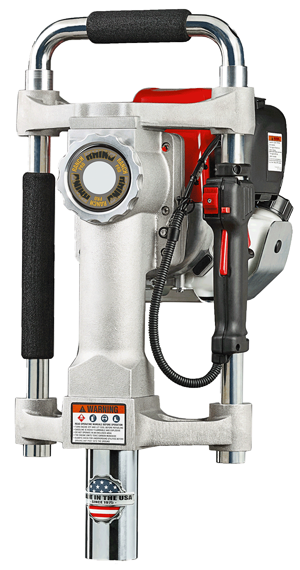 Rhino's Gas Post Drivers are all made in the United States, for the highest quality workmanship and durability. The materials used in the construction include aircraft-grade aluminum, heat-treated steel, American-made Honda engines, and stainless steel fasteners and bearings. Powered by the legendary Honda GX35 4-stroke engine, which has gone through the stringent Honda certification process for use in this tool. Made in America for highest quality workmanship from the highest quality materials: high-grade virgin aluminum cast body, shock resistant heat-treated steel components, aircraft quality aluminum internals, and sealed bearings on all rotating parts. Ergonomically designed handles that allow for user comfort and improved handling - the Pro series has been designed for ease of transport and use. User friendly: quick-lock adaptor allows for application change in seconds. "Rhino has an unsurpassed reputation in pneumatic drivers and they went to great lengths to ensure the gas powered drivers would exceed all expectations. To that end – they went above and beyond with their material selection and quality control. To ensure quality - all of Rhino’s parts are manufactured at Rhino or within 50 miles of their plant in Kewanee Illinois – USA. They did not merely change the aperture on the GPD45 but re-engineered it to incorporate larger pistons, hammers and anvils to give it a quantifiable increase in power necessary for larger posts and more demanding conditions. 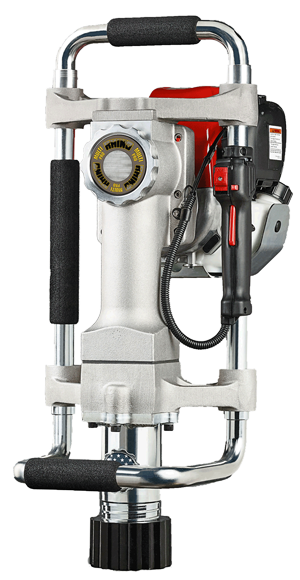 We are proud to be a leading stocking distributor of these exceptional post drivers manufactured by Rhino Tool Company." *Same day shipping when order placed before 2:00 p.m. MST.